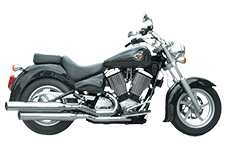 Viking Bags offers a complete selection of saddlebags, whether you're looking for small or large saddlebags. 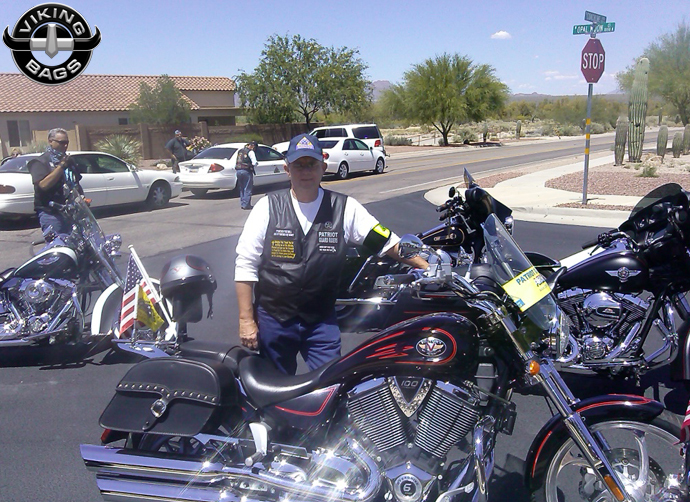 We strive to only offer the best in Victory Saddlebags. 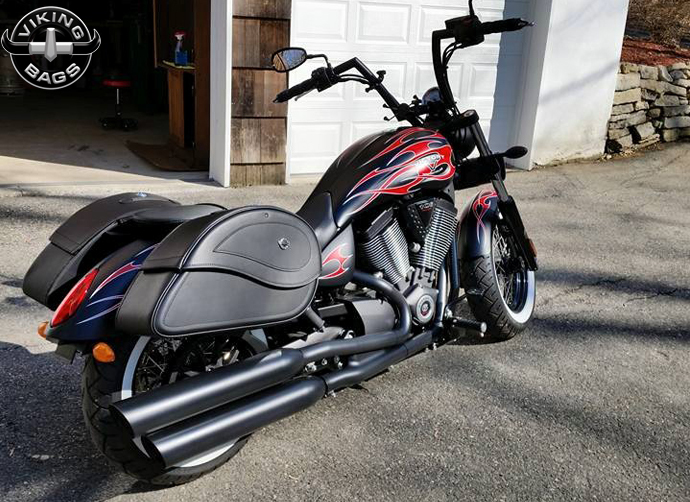 Add some style to your stock bike and stand out from the general crowd. For both experienced and newbie motorcycle riders, saddlebags are something that everyone should have. 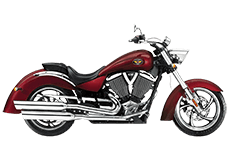 Viking bags provides some of the highest quality and most well regarded saddlebags for Victory Motorcycles. 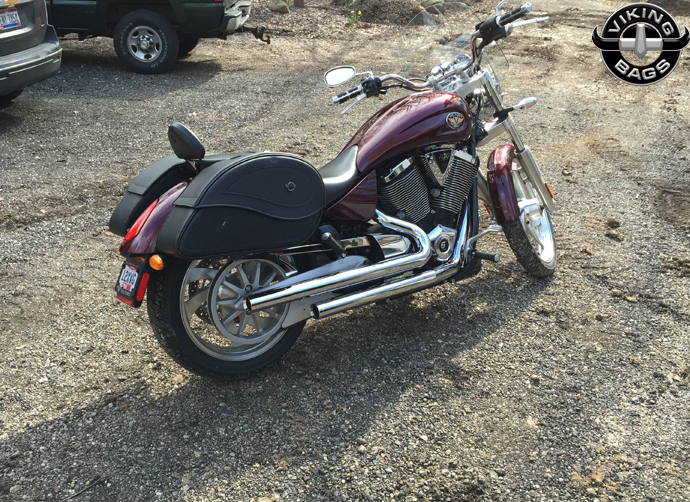 Whether you're just using the saddlebags for storage or intend on taking cross country trips with them. You can rely on Viking bags. Here in our online store, you'll find the finest selection of saddlebags specifically tailored for use with Victory motorcycles. We pride ourselves in featuring the best in luggage compartments for bikes, and that's exactly what Viking Bags delivers. Have a look inside of our online store here, and you'll start to understand exactly how our bags stands out from the competition. Viking Victory Saddlebags are made with high quality stitching and accents. Every single Victory bag has a built-in hard shell that prevents sagging for years. In our online store, we sell some of the best manufactured Victory saddle bags with durable synthetic leather that is easy to maintain and clean in all weather conditions. 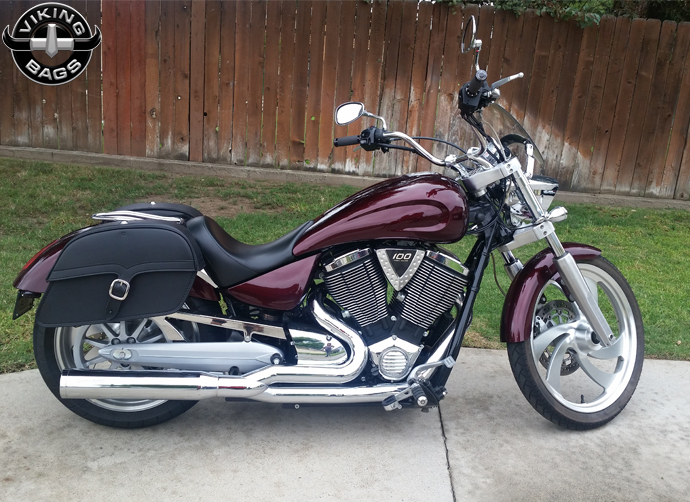 Best of all, Viking Victory bags come with a free mounting system that is a hard mount or throw-over style/ We are so confident about our Victory motorcycle saddlebags that we offer a 30 day money back guarantee. 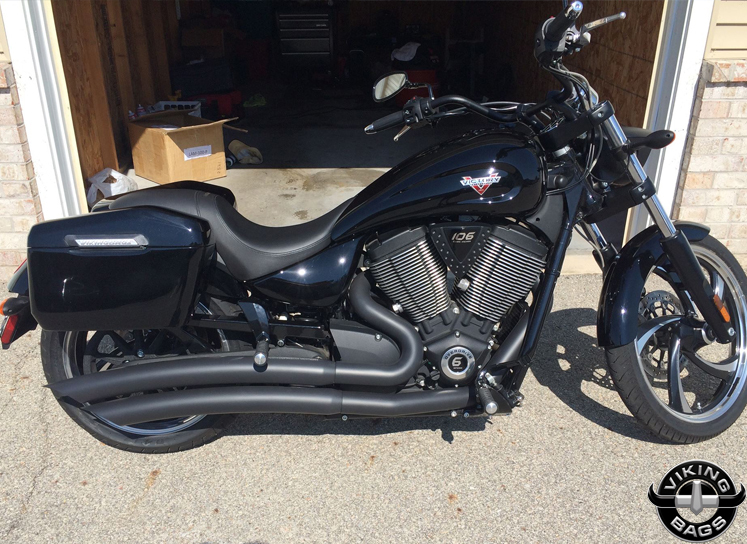 Vikingbags.com offers the best Victory Saddlebags for Victory Motorcycles. We offer Victory bags specifically for Victory Boardwalk, Hammer, Kingpin, V92C, and Vegas model and a variety of looks and sizes. 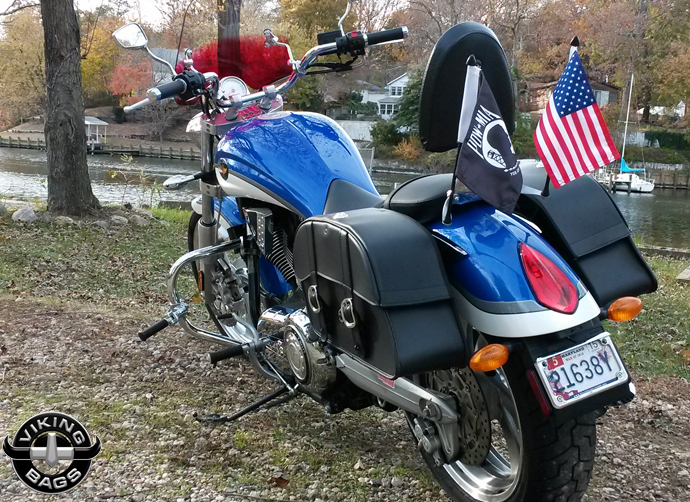 Our Victory Saddlebags are durable, reliable and easy to mount. 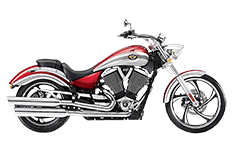 Customers who have purchase a Victory Motorcycle luggage bag will receive a free set of mounting hardware. Victory saddlebags are the right choice for passionate bikers who love to carry their things along while they travel on their bikes. It is a handy accessory which has great utility. They provide the best support system for bikes and remain in great shape even after many years of use. 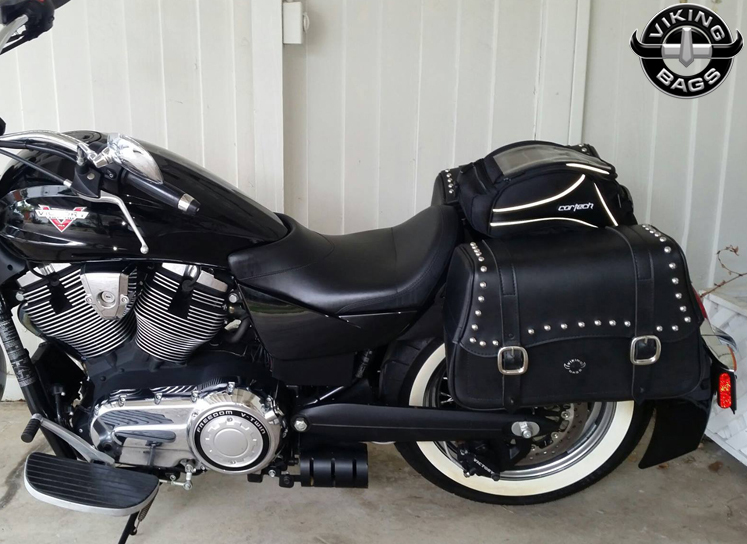 Victory saddlebags from VikingBags are well known for their gorgeous look and feel. Ordinary saddle bags tend to lose their shape after a few years of use and create a disastrous apperance in the motorcycle. With Victory bags, you can be assured that it is going to stay in shape even years after rough usage. Strong, plastic pipes are inserted along the edges to provide additional support and strength. Waterproof lining and heavy duty water-proof zippers will keep things safe inside the saddlebag even during heavy rains. A Velcro enclosure system maintains an airtight seal around the perimeter of the bag, therefore riders need not worry about harmful elements penetrating the interior and damaging the contents. The multiple pocket system actually proves to be useful for carrying many things in your saddlebag. Riders get a high-quality organizational ability with every model of Triumph saddlebag, no matter which is chosen. Premium quality material is used to manufacture Victory saddlebags, perfect for all-weather riding and long-distance travel. Custom-made liners to these saddlebags are also available with the retailers. Buy the right one that fits into your pannier system effortlessly. For convenience, you can just detach the saddlebag from your bike and carry it on your shoulders. They have the best quality shoulder straps which make even this super comfortable. 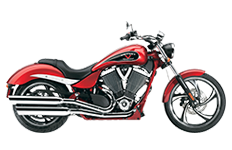 Saddlebags for Victory combine functionality with style, so riders don't have to sacrifice one necessary feature for the next. Each saddlebag comes with the best quality lid inserters, utility pouches and stiffeners which keep the saddle bags intact even after a bumpy ride. You would think that with such sophisticated styling, design aesthetics and traditional functionality that price would be reserved for the elite. However, we want you to have these Viking Bags at an affordable price, for every rider! 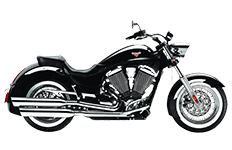 Aside from the standard features riders will find on every model, Viking has also included a set of innovative features with patents pending to really create an awesome experience with your Triumph saddlebags. 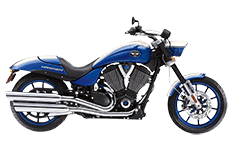 For instance, Viking uses a locking mechanism and key system to provide riders with a worry free riding experience. Loss and theft are easily prevented when riders are away from the bike, yet convenient access is allowed when needed. Additionally, Viking uses stainless steel, polished chrome buckles to withstand the extremities of every day travel. It's this fine attention to detail that gives Viking the leg up on the competition. Your satisfaction is one of our highest priorities here, so make sure you let us know if there's anything we can do to help. Likewise, we offer a 30-day money back guarantee on all of our inventory, and that includes every Victory saddlebag you find in this collection. If you need to return or exchange a bag for whatever reason, we'll fully refund your money or find you a better pair of saddlebags for your Triumph bike. That's our promise to you; we guarantee it! 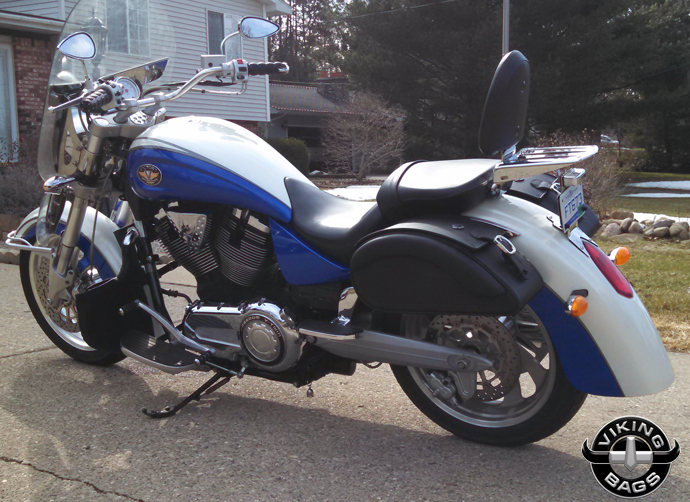 So give us a call today, and see how your riding experience can improve with Viking Bags!